Parasites, which thrives in the intestines of another organism. Even though there are thousands of parasites which infects humans, only four are very important. They are: Roundworms; Pinworms; Whipworms and Tapeworms. Symptoms and indications: The usual symptoms of intestinal worms are diarrhoea, foul breath, dark circles under the eyes, constant desire for food, and restlessness at night with bed dreams, anemia and headaches. Round worms may give rise to inflammation of the intestine and lungs, nausea, vomiting, loss of weight, fever nervousness. Causes and risk factors: Eating contaminated food causes round worms. Hookworms enter the human body through bare foot walking on infected earth. Tapeworms are transmitted to the body through under cooked flesh foods or foods contaminated by dogs. 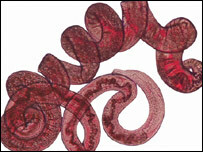 The real cause of intestinal worms, however, is faulty living. The eggs of these worms, taken into the human body through food and water, can breed in intestines only if they find there a suitable medium for their propagation. The medium is an intestinal tract clogged with morbid matter.